It’s eclectic. It’s like an octopus. Yes, just when you thought the word eclectic had become too hackneyed a term, there is really no better way to describe this year’s MIJF, which had its program launch at 6pm today. The program devised by Sophie Brous is indeed wide-ranging, broad-based, extensive, comprehensive, varied, diverse, catholic, all-embracing, multifaceted, multifarious, heterogeneous, miscellaneous and assorted. Like an octopus reaching out in many directions, the MIJF seems to defiantly defy encapsulation, yet it must surely offer — to use a standard phrase — something to appeal to everyone. Yes, parts of the program will invite the query “Is this jazz?” and others will provoke or irritate. But no one can deny that any line-up mixing Sonny Rollins and Jason Moran with the ironed-smooth Chris Botti (apparently it rhymes with goatee) and the krautrock of Faust, or the resonant scream of Korean Pansori singer Bae Il Dong with the minimalist drone of Tony Conrad is never going to be boring. Ausjazz blog was there when Brous gave her usual impressive, lightning-fast briefing on what to expect, but there’s no other way to grasp the enormity of this program apart from just diving in and going with the flow. All the fine details are available on the MIJF website, but hang on for a roller-coaster ride through the main events — probably in a little more detail than is possible via print media. The emphasis, says Brous, is on the playful aspect of improvisation and on encouraging participation, so there will be free activities in day in the city “so people can explore their inner creator”. The Big Jam, which attracted 5000 people last year, returns to Fed Square at 2pm on June 4, hosted by 774 ABC radio’s Derek Guille and supported by “pied pipers” — musicians at rail stations across the suburbs who will encourage people to bring trumpets, violins, clarinets, sousaphones, kazoos and any other instruments to join in a mass music-making event. The event, if last year’s is any guide, will be less of a cacophony than many will expect. The free Opening Celebration Concert follows at 3pm, with Melbourne’s fez-wearing 1930s swing ensemble Cairo Club Orchestra and international guests to be announced shortly before the festival opens. Other free events include morning sessions in Fed Square entitled Sonic Showers in which trained and untrained voices will be invited to sustain a pitch in a bid to produce “beautiful harmonic clusters” that, according to Brous, will be like “the heavens opening” and a musical pick-me up akin to tai chi. On selected evenings acoustic ecologist Anthony Magen will host evening sound walks encouraging active listening without communication in the city centre. And there will also be jazz musicians staging mini concerts across the public transport network from early May and daily during the festival. The heart of the festival’s large-scale outings are in this series of 15 musical events, which include a repeat of last year’s Overground six-hour extravaganza celebrating the city’s underground creative music culture at Melbourne Town Hall on Sunday, June 12. The opener is Fly Me to the Moon, an evening of jazz standards “from Cole Porter to Irving Berlin and beyond” at the Palais on June 4 that carries on from last year’s Baby It’s Cold Outside, which Brous described as celebrating “that caramel-toned schmaltz we’ve grown to love from the great crooners”. This time the vocalists will be Tex Perkins, Paris Wells, Eddie Perfect and Kimbra, backed by the Sam Keevers Trio. That concert won’t set my heart pounding, but on Sunday, June 5 it’ll be a different, surreal kettle o’ fish when original Sun Ra collaborator Marshall Allen leads the 10-piece Sun Ra Arkestra in two sets at the Forum — described by sources close to MIJF as “a bunch of old space invaders” keeping alive the spirit of pianist, composer and organist Sun Ra. 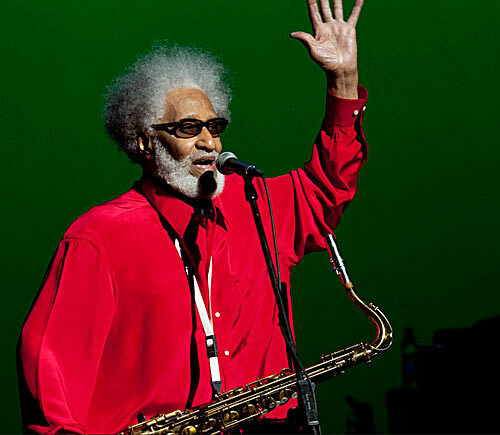 It gets better, with tenor sax great Sonny Rollins at Melbourne Town Hall on Monday, June 6 with Peter Bernstein on guitar, Bob Cranshaw on bass, Kobie Watkins on drums and Sammy Figueroa on percussion. Mind you, if you feel a desperate need instead to be smoothed into a mood of mellow mellifluousness, Chris Botti will be at the Melbourne Recital Centre on June 5 and 6. Botti lovers may not be so soothed by the eight brothers from Chicago who form the Hypnotic Brass Ensemble. Their father, Philip Cohran, played with Sun Ra in the 1950s. Inspired by hip-hop artists such as Public Enemy and N.W.A. (Niggas With Attitudes or Niggaz With Attitude), the brothers “sound like a live sample of a lot of hip-hop we hear and it’s really dense and well arranged brass music with a heavy drummer and eight brass players”, Brous says. The inventiveness doesn’t stop. On Wednesday, June 8, Jason Moran, who was a hit last year, brings his Bandwagon (Tarus Mateen on bass and Nasheet Waits on drums) to the Forum. An adventurous jazz pianist also influenced by J Dilla and rapper Nas, Moran brings sampling into his live performances. In a double bill, Bandwagon will be joined by Indian-born US-based Vijay Iyer (piano) and Rudresh Mahanthapa (alto sax), who view contemporary jazz, as Brous puts it, “through the lens of Indian and Asian musical influences”. On Thursday, June 9, the Andrea Keller Quartet will open at the MRC for saxophonist and cool jazz exponent Lee Konitz, who played with Miles Davis on The Birth of the Cool album, accompanied by special guest Kurt Rosenwinkel and young New York players Dan Tepfer on piano, Joe Sanders on bass and Johnathan Blake on drums. On Friday, June 10, Anthony Pateras’s Thymolphthalein will open at the Forum for the cult German krautrock band Faust, who Brous says “occupy a mythological space and only play when the situation’s right”. This “night of sensory overload” will feature original Faust members Werner “Zappi” Diermaier on drums and percussion, and the UK’s Geraldine Swayne on vocals, guitar, organ and visuals. At MRC, Ron Carter, who Brous describes as “the grand poobah of jazz bassists” and who was a member of Miles Davis’s sixties quintet, will perform with Russell Malone on guitar and Mulgrew Miller on piano. Katie Noonan will also sit in (she worked with Carter on the Blackbird album of Lennon McCartney music) as well as performing as Elixir with Zac Hurren on sax and Stephen Magnusson on guitar. Rosenwinkel — who Gary Burton plucked from Berklee School of Music at age 19 and who later joimned Paul Motian’s bebop band Human Feel — is back at the MRC at 7.30pm on Saturday, June 11 with his Standards Trio (Eric Revis on bass and Justin Faulkner on drums) for an intriguing double bill with “beautiful, honey-toned but really contemporary” vocalist Norma Winstone, who will be joined by Glauco Venier on soprano sax and bass clarinet, and Klaus Gesing on piano to perform music from their Stories Yet to Tell album. In the Forum from 8.30pm Australian group The Raah Project will perform “big band ensemble music moving into the realm of lounge”, with lighting design by Blue Bottle, known for Chunky Move visuals. And from 9pm that night until 1am, minimalist drone music will fill the Melbourne Town Hall — expect sustained or repeated sounds, notes or tone clusters from mostly electronic instruments or processing, with slight harmonic variations. The stars will be composer, organist, pianist and visual artist Charlemagne Palestine, who will play the Grand Organ, and avant garde video artist, filmmaker, sound artist and composer Tony Conrad, who, with LaMonte Young and John Cale, was a member of The Theatre of Eternal Music, a mid sixties experimental drone music group that performed on the US east coast and in western Europe, known for using discordant, sustained notes and loud amplification. I love this: most of the pieces performed by The Theatre of Eternal Music had long titles, such as The Tortoise Recalling the Drone of the Holy Numbers as they were Revealed in the Dreams of the Whirlwind and the Obsidian Gong, Illuminated by the Sawmill, the Green Sawtooth Ocelot and the High-Tension Line Stepdown Transformer. Conrad was allegedly indirectly responsible for the name Velvet Underground, because Lou Reed and Cale found a book of that title in Conrad’s old apartment in New York City. Sunday, June 12 will see Charlemagne and Conrad headlining Overground, with many other performers taking over spaces in the town hall from 3pm to 9pm. Tim Berne, Mary Halvorson, Golden Fur and Sean Baxter are among the attractions. And from 8.30pm at the Forum, the Paul Grabowsky Trio (Julien Wilson on sax, Frank Di Sario on bass, Niko Schauble on drums) will join a chamber orchestra to perform The Eye of the Storm, which Grabowsky wrote for the Fred Schepisi’s forthcoming film of that name. Grabowsky and Branford Marsalis recorded a live version of this work in October last year. This will be a festival highlight. To wrap up the Modern Masters series of concerts, James Morrison and some of Australia’s swing greats will perform A Tribute to Australian Swing, taking the audience through our history as it evolved with influences from visiting American swing bands in the 1920s. The Forum Upstairs and the Salon at Melbourne Recital Centre will host 10 Jazz Up Close concerts, beginning at 1pm on the opening Sunday, June 5, with eastern European melodies and contemporary jazz from the 3Cohens Sextet — a set of three Cohen brothers from Israel and the US — and US pianist Aaron Goldberg, who returns with Rueben Rogers on bass and Greg Hutchinson on drums. At 6pm that day, AlasNoAxis drummer Jim Black will join Chris Speed (who with the Claudia Quintet last year was a highlight), Hilmar Jensson on guitar and Skuli Sverrisson on bass to “explore elements of post rock in the context of improvised music”, to quote Brous. And an arresting set from Chiri, comprising Scott Tinkler on trumpet, Simon Barker on drums and the amazing Korean Pansori singer Bae Il Dong will complete the gig. Bae Il Dong sang beside a waterfall for 18 hours a day for seven years, building up scar tissue on his vocal cords and developing a deep, rumbling resonance. New York drummer Ari Hoenig will join Perth-based saxophonist Jamie Oehlers in a double bill on Tuesday, June 7 with Vijay Iyer, who will perform solo. And The Forum Upstairs is also the venue for a June 10 concert on the Friday night of the festival’s closing weekend. It should be something special, with Jason Moran joining Scott Tinkler and Simon Barker, before Tim Berne (who featured in his exciting Adobe Probe Melbourne at Bennetts Lane) ushers in his Los Totopos (“corn chips”) band with Oscar Noriega on clarinet, Matt Mitchell on piano and Ches Smith on drums. In an Australian premiere the following night, New York’s guitarist Mary Halvorson — who has been likened to composer and instrument creator Harry Partch — will bring her trio to the Forum Upstairs in a double bill with Japanese pianist Satoko Fuji in “Ma-Do” (the silence between the notes”) with husband, trumpeter Natsuki Tamura. Bell-Award-winning Coco’s Lunch vocalist Lisa Young will form a quartet on June 12 at 1pm with Stephen Magnusson on guitar, Ben Robertson on bass and Dave Beck on drums to perform her song cycle The Eternal Pulse, with south Indian vocal percussion. And Magnusson will then unveil his Magnet project with Eugene Ball on trumpet, Sergio Beresovsky on drums and Carl Panuzzo on vocals to complete the gig. And at 6pm pianist Joe Chindamo will join Phil Rex on bass and Rajiv Jayaweera on drums in a double bill with the energy and allure of Sarah McKenzie‘s trio (David Rex sax, Sam Zerna bass and Craig Simon drums). Jazz Up Close sessions in the MRC Salon will comprise Albare (Dadon), Anthony Pateras’s Thymolphthalein and Jim Black with students from Monash University. There will be some really exciting gigs in this series of 14 concerts, but I reckon it’s best to start another post to deal with what’s in store therein. It seems that the involvement of Australian musicians in this eclectic and octopus-like festival may not be as great as in last year’s, at least in the sense of supporting international drawcards. But the Bennetts Lane series will help make up for that. Look for another post soon on the At The Club series and free masterclasses. My laments? I always wish that the Melbourne’s regular jazz haunts such as Uptown Jazz Cafe, Bar 303 and Paris Cat, and also Jazz Vibe on Smith, would be included among the festival venues. And I am sorry that there will not be any sessions at the Wheeler Centre in which visiting and local musicians can chew the fat and respond to audience questions. Now it’s time to post. Apologies for any errors. I may add some images later. This entry was posted in MIJF 2011 and tagged 3Cohens Sextet, A Tribute to Australian Swing, Aaron Goldberg, AlasNoAxis, Albare Dadon, Andrea Keller Quartet, Anthony Magen, Anthony Pateras, Ari Hoenig, At The Club, Baby It’s Cold Outside, Bae Il Dong, Bandwagon, Ben Robertson, Big Jam, Blue Bottle, Bob Cranshaw, Branford Marsalis, Cairo Club Orchestra, Carl Panuzzo, Charlemagne Palestine, Ches Smith, Chiri, Chris Botti, Chris Speed, Chunky Move, Claudia Quintet, Coco's Lunch, Cole Porter, Craig Simon, Dan Tepfer, David Rex, Derek Guille, Eddie Perfect, Elixir, Eric Revis, Eugene Ball, Faust, Fed Square, Fly Me to the Moon, Frank Di Sario, Fred Schepisi, Gary Burton, Geraldine Swayne, Glauco Venier, Golden Fur, Greg Hutchinson, Harry Partch, Hilmar Jensson, Human Feel, Hypnotic Brass Ensemble, Irving Berlin, J Dilla, James Morrison, jamie oehlers, Jason Moran, Jim Black, Joe Chindamo, Joe Sanders, Johnathan Blake, julien wilson, Justin Faulkner, Katie Noonan, Kimbra, Klaus Gesing, Kobie Watkins, krautrock, Kurt Rosenwinkel, Lee Konitz, Lisa Young, Los Totopos, Ma-Do, Magnet, Marshall Allen, Mary Halvorson, Matt Mitchell, Melbourne International Jazz Festival 2011, Melbourne Town Hall, MIJF 2011, Miles Davis, Modern Masters, Mulgrew Miller, N.W.A., Nas, Nasheet Waits, Natsuki Tamura, Niggas With Attitudes, Niggaz With Attitude, Niko Schauble, Norma Winstone, Oscar Noriega, Overground, Palais, Pansori, Paris Wells, Paul Grabowsky Trio, Paul Motian, Peter Bernstein, Phil Rex, Philip Cohran, Public Enemy, Rajiv Jayaweera, Ron Carter, Rudresh Mahanthapa, Rueben Rogers, Russell Malone, Sam Keevers Trio, Sam Zerna, Sammy Figueroa, Sarah McKenzie, Satoko Fuji, scott tinkler, Sean Baxter, Sergio Beresovsky, Simon Barker, Skuli Sverrisson, Sonic Showers, Sonny Rollins, Sophie Brous, stephen magnusson, Stories Yet to Tell, Sun Ra, Sun Ra Arkestra, Tarus Mateen, Tex Perkins, The Big Jam, The Birth of the Cool, The Eternal Pulse, The Eye of the Storm, The Forum, The Raah Project, The Theatre of Eternal Music, Thymolphthalein, Tim Berne, Tony Conrad, Vijay Iyer, Werner “Zappi” Diermaier, Zac Hurren. Bookmark the permalink. Oh Roger, it’s just not fair–you have so whetted my appetite for the festival –what a program and I’m still living in hope that I will be invited. I went to hear Jo Chindamo play recently –magic that’s the word for him.